In the barren deserts of the Arabian Peninsula, people have always settled in locations that provided freshwater and enough natural resources to enable trade and economic development. 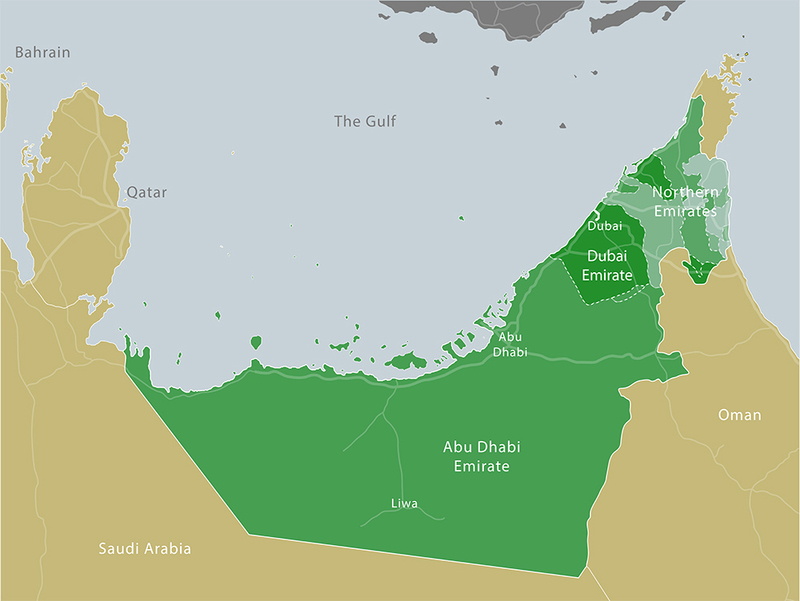 Human settlements in the southern shores of the Gulf, in what we now know as the United Arab Emirates (UAE), are no exceptions to this. For the last four centuries, the Bedouins of the Banu Yas tribes have settled a strip of land along the northern edge of the dune fields of the Arabian Peninsula’s Empty Quarter. Drawn to its plentiful ground water resources they established what is now known as the Liwa Oasis and developed date plantations which provided subsistence. But when fresh water was discovered on the Abu Dhabi Island in the late 18th century, Al Bu Falah branch of Banu Yas moved to the coastal location which – in addition to providing fresh water- also allowed them to develop pearling industry and trade. In the early 19th century, another branch of the Banu Yas, known as Al Bu Falasa, moved from the Abu Dhabi Island to settle near a natural creek 90 miles east of the Abu Dhabi Island. In addition to ground water and pearling, the creek – now known as the Dubai Creek- allowed the establishment of a port which facilitated trade with neighbors across the gulf and beyond. They quickly established a settlement on the western shore the creek – known later as Bur Dubai – but had to abandon it two decades later and move to the eastern shore after a smallpox outbreak. By the end of the 19th century, the combined advantages of fresh water availability, the natural port, the pearling industry, and the good geographic location, were sufficient for the new settlement to endure a sweeping fire that burnt through most of it dwellings. The Bedouins that have settled in Dubai sought no other location and simply rebuilt their settlement. Those who visit the Middle East and North Africa from more temperate climates are often struck with how hot and dry the region is, and how scarce its rainfall. Some wonder why cities became established here, and how they continue to exist despite the lack of renewable freshwater. These concerns are not entirely groundless. Yet these cities’ existence is not in any way miraculous: it’s merely an example of what can happen if cities fail to strike a sustainable balance between growth and limited resources.